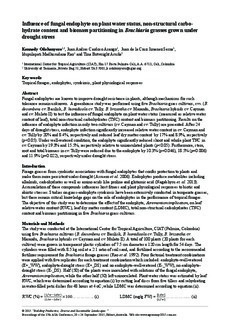 Copyright 2015 Australian Society of Agronomy Inc.
Fungal endophytes are known to improve drought resistance in plants, although mechanisms for such tolerance remain unknown. A greenhouse study was performed using five Brachiaria grass cultivars, cvs. (B. decumbens cv. Basilisk, B. humidicola cv. Tully, B. brizantha cv. Marandu, Brachiaria hybrids cv. Cayman and cv. Mulato II) to test the influence of fungal endophyte on plant water status (measured as relative water content of leaf), total non-structural carbohydrates (TNC) content and biomass partitioning. Results on the influence of endophyte infection in only two cultivars (cv. Cayman and cv. Tully) are presented. After 24 days of drought stress, endophyte infection significantly increased relative water content in cv. Cayman and cv. Tully by 20% and 8.4%, respectively and reduced leaf dry matter content by 17% and 8.9%, respectively (p<0.05). Under well-watered condition, the endophyte significantly reduced shoot and whole plant TNC in cv. Cayman by 19.3% and 15.5%, respectively relative to uninoculated plants (p<0.05). Furthermore, stem, root and total biomass in cv. Tully were reduced due to the endophyte by 10.3% (p=0.046), 18.5% (p=0.006) and 11.9% (p=0.022), respectively under drought stress.